Darren Cementina and Annabelle Fox (with Ben Sheppard in the background) in A Charlie Brown Christmas. BOTTOM LINE: A lovely adaptation of one of the most beloved holiday TV specials of all time. Most grownups merely need to listen to the first notes of Vince Guaraldi and Lee Mendelson’s “Christmas Time Is Here” to get misty-eyed. The mellow bass and melancholy piano immediately evoke memories of holidays past, childhood experiences, and the image of Charlie Brown’s sad little Christmas tree. It makes sense that Guaraldi’s score welcomes audience members at the Secret Theatre’s production of A Charlie Brown Christmas, as musical director/pianist Joe Marx and his band (Noah Hadland on drums and Ben Sheppard on bass) sit in front of a blue-sky backdrop covered with faux snow and hanging cotton-like clouds: the cartoon come to life. A Charlie Brown Christmas is an adaptation of the 1965 television special by Bill Melendez and Lee Mendelson, starring Charles M. Schulz’s beloved Peanuts’ characters. 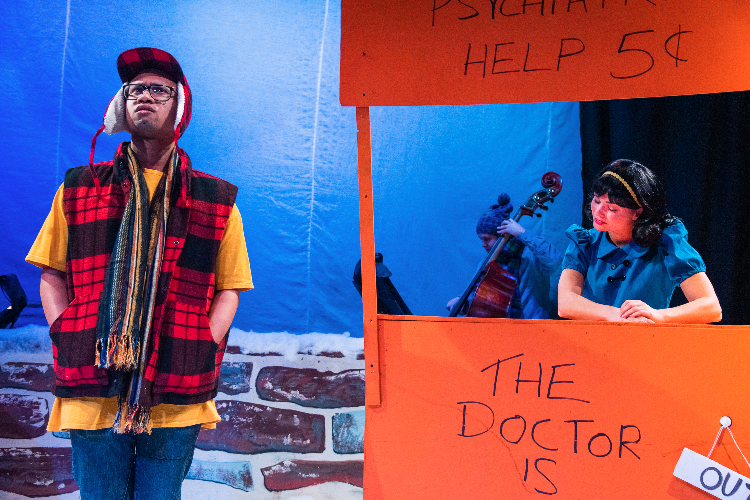 The plot is poetically simple: eternal existentialist Charlie Brown (played with adorable neuroticism by Darren Cementina) is puzzled by the true meaning of the holiday. Is Christmas about the presents, shopping, and rampant commercialism? Or is there more than meets the eye? Charlie’s depression isn’t helped by the fact that his friends all seem to be more interested in material possessions than spiritual fulfillment. Heck, even his dog Snoopy (a perfect, droll Koyu Ugiya) enters a Christmas decoration contest in hopes of earning a cash prize. At the advice of the bossy Lucy (Annabelle Fox), Charlie decides to direct a Christmas school play, only to realize his cast is more interested in developing modern artistic tendencies than with the meaning of Christmas. Poor Charlie becomes so obsessed with the idea of preserving the essence of the holiday that he even gets the wrong kind of Christmas tree, choosing a sad little sapling he has faith in, rather than the modern metallic trees others are going for. It’s no spoiler to say that Charlie Brown’s Christmas turns out to be alright in the end. The television special has become a staple of the holiday season, and the Secret Theatre has done the musical production for three consecutive years. The beauty in this version, directed and choreographed by Joy Donze, is how it pays tribute to the beloved animated special, while updating it so that it makes sense in 2018. But perhaps the most exciting part is seeing the bewitching effect A Charlie Brown Christmas has on younger audiences, who sat enraptured and cheered whenever things turned out well for Charlie Brown, or whenever Snoopy stole the show. Director Donze does a wonderful job instructing the actors on how to react to children who want to be part of the performance. During a lovely moment, a young boy sitting in the front row gasped loudly. Rather than chastising him for his natural reaction, one of the actors came up to him, knelt, and whispered something in his ear that made him laugh even louder, making sure this would be a theatrical experience that little boy would remember for the rest of his life. A Charlie Brown Christmas is by Charles M. Schulz. Based on the television special by Bill Melendez and Lee Mendelson. Stage Adaptation by Eric Schaeffer. Directed and Choreographed by Joy Donze. Musical Director is Joe Marx. Scenic Design by Samantha Cancellarich. Costume Design by Cassaundra Franklin. Lighting Design by Paul T. Kennedy. Assistant Director is Hunter Walsh. Production Stage Manager is Elizabeth Weber. Production Manager is Justin Hsu. The cast is Matthew James Anderson, Hudson Bauer, Emily Brennan, Darren Cementina, Annabelle Fox, Kevin Gonzalez, Sarah Joy Kane, Joe Marx, Koyu Ogiya, Hope Salvan, Hunter Walsh, and Audrey Yeoman. The band is Joe Marx, Noah Hedlund, and Ben Sheppard. Playing Woodstock (each for 1 or 2 performances) is Beckett Lopez, Maddie Ward, Leonardo Kettells, Olivia Culver, Hudson Bauer, Amalia Vita-Harris, Brandon D'Elia, Alessandra Poso, Vivian DeFalco, and Naomi Schulz.